In the early 1900's, there were older homes in the area of the Capitol building. 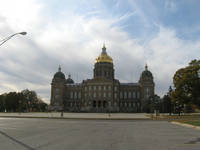 This view was taken east of the state house and forms a part of one of the principal drives around the Capitol grounds. There is no longer a circular drive around the Capitol from the east side, nor are there residential buildings as shown in the previous photo. There are only parking lots now immediately east of the Capitol. This area shows houses across east of the Capitol facing East 12th Street. Note the laundry hanging on the line in the left side of the picture. 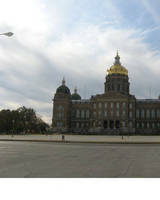 Here is a view of the parking lots east of the Capitol in 2010. 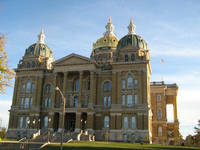 The north entrance of the Iowa Capitol as shown here in the fall of 2010 faces Grand Avenue. The west entrance, to the right, faces east 9th street. East 10th street does not go through here anymore. This photo shows a house on Des Moines Street that partially blocks the view of the back side of the Historical Building. You can also see the top part of the Capitol to the right and south of the Historical Building. 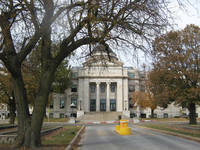 This photo shows the back of the Ola Babcock Miller Building (formerly the Historical Building) in 2010 hidden by the the Vocational Rehabilitation Building facing Des Moines Street. This building replaces a house that was torn down.